Pick though the crab meat to make sure there are no small bits of shell, drop into a large bowl in case you missed any shell. Lightly season with salt and pepper, add olive oil and lemon juice. Chopped the chives and if you are lucky enough to have green fennel tops chop some of those as well add to the crab mix as well as the chopped shallot. Slice the radish and fennel as thinly as possible. 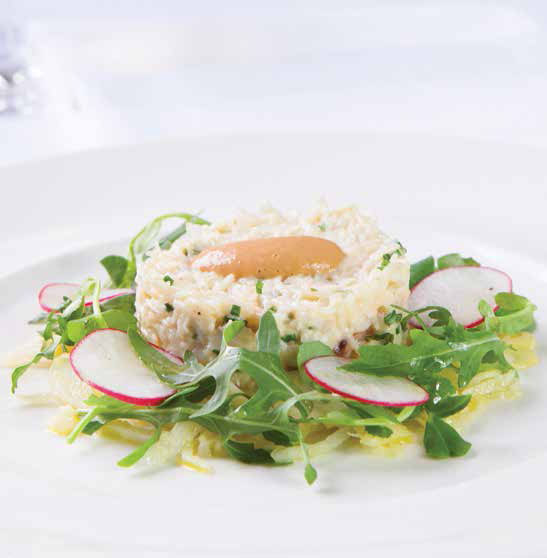 Spoon the crab onto the centre of the plates, in a clean bowl adds the thinly sliced fennel, radish and rocket, dressed with a little olive oil and lemon juice and arrange with the plated crab.